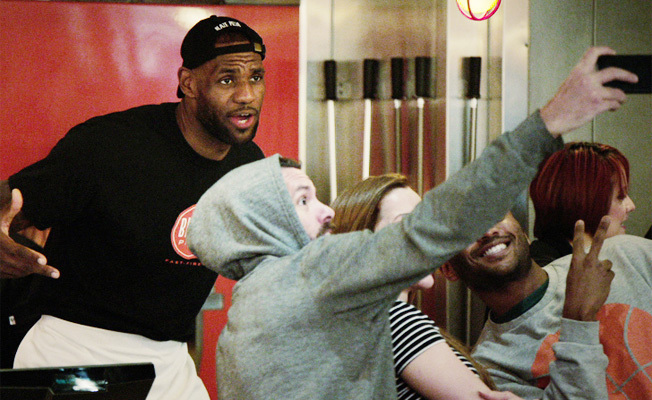 LeBron James hidden camera stunt for Blaze Pizza that launched Friday morning. Synthetic Pictures signs Director Walter May to roster. Synthetic Pictures has added director Walter May to its diverse roster. One of their first projects together is a LeBron James hidden camera stunt for Blaze Pizza that launched Friday morning and was featured on Good Morning America, Sports Illustrated, CBS Sports, The Bleacher Report, The Washington Post, and dozens of other news outlets. May is a Los Angeles based director, and former 72andSunny Creative, known for his stylized and design-driven visuals for brands such as Toyota, Starbucks, ESPN, Walmart, Activision & Smirnoff. Synthetic and May's first projects together include the Blaze Pizza hidden camera campaign featuring LeBron James, and a Red Bull campaign with Omelet LA. May often works with celebrity talent including Katy Perry, Kobe Bryant, Mike Ditka, Serena Williams, Eminem, and LeBron. May has more than 5 years experience within the advertising agency walls as a hybrid Director/Editor/Creative talent at Los Angeles based 72andSunny. He was a writer on the team which created "The Vet & the n00B" for Call of Duty that won the 2013 Grand Effie Award. In November of 2010, May launched a viral video for his girlfriend entitled “I Hope This Gets To You” which received over 1.3 million hits within 2 days. The song, which he co-wrote with the Daylights, reached Top 20 in both the iTunes Rock and XM Radio charts. The video won the Webbies “Best Viral Video” Award, a 2011 Cannes “Cyber Lion Finalist” award, as well as 2011 ThinkLA “Best Use of Social Media” award. May is excited to join Synthetic where he can keep growing as an artist, “My goals are to help adapt and define the new era of where production is going,” says May, “Synthetic has an open mind about how to tell the stories, and they’re willing to understand my ideas and help guide me at the same time. It’s a great match.” May’s directing has also been transitioning into the content world through documentary and web series. He filmed a documentary on Katy Perry's Superbowl XLIX Halftime Show performance. His web series “Trailer Park Heroes” starring Zac Levi, Nathan Fillion, Jason Biggs, and others was featured on Break.com and received millions of impressions within the first week of its launch. May’s love for music videos, photography and painting continue to be a creative outlet. In March 2016 his mixed media artwork with visual artist Tyler Ramsey went on display at CTRL Collective in Los Angeles, sponsored by TOMS, and multiple celebrities, creatives, and entrepreneurs were at the the premiere party that saw nearly a dozen pieces sold on sight. May's unique artistic lens shines through his work, combining his passions for storytelling, fashion, and visuals. Walter May's new home, Synthetic Pictures, is an award-winning production company specializing in commercials, branded content and filmed entertainment. Founded in 2002, Synthetic Pictures has offices in Los Angeles, Austin, and New York City. May joins Synthetic’s diverse roster of live action directors. Synthetic works with top agencies including BBDO, Leo Burnett, Doner, Pitch, Agencies of Change, TM Advertising, GSD&M, Publicis, JWT, R&R Partners, Campbell Mithun, Loomis, Ramey, Integer Group, LGA, Omelet, Commerce House, Agency RX, Peter Mayer, CDMi Connect, Tombras and Wunderman on projects for clients such as Chrysler, Dell, Vegas Tourism, Dodge, Jennie-O Turkey, Shell, Bahamas Tourism, Red Bull, Southwest Airlines, MasterCard, Procter & Gamble, Special K, Dairy Queen, T Mobile, Secret Deodorant, Burger King, BMW, Intel, Texas Tourism, HP, Invisalign, SunTrust Bank, Bon Home, AMD, Blue Cross/Blue Shield, Reebok, Sony, WalMart, Rug Doctor, Genentech, DreamWorks, Vegas Uncork’d, SkyCaddie, GelPro, McAlister’s Deli, Superpages.com, Time Warner Cable, Organic Voices, and the American Red Cross.